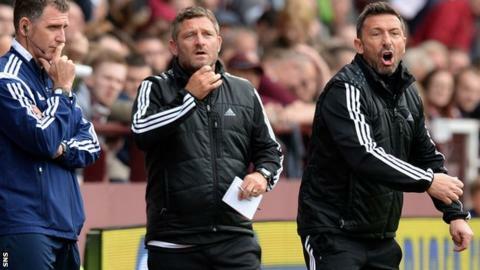 Scottish Premiership leaders Aberdeen must guard against complacency, their manager Derek McInnes has warned. The Dons beat Hearts 3-1 on Sunday for their eighth consecutive win, keeping them five points clear of Celtic. "To have accumulated 24 points at this stage, we've got to be pleased with that," McInnes told BBC Scotland. "We have had to earn every one of them. No game has been easy. The danger is that we start to think that we can just turn up to win games." Aberdeen, backed by a large travelling support at Tynecastle, were three goals up on Robbie Neilson's side at half-time, thanks to a double by David Goodwillie and a skilful strike by Niall McGinn. "The first half was full of intelligence, there was quality to our goals," continued the Reds boss. "The players deserve a lot of credit. It was one that people thought we might trip up on. "Hearts are a good side but we were always confident that the team picked could get the job done. "You've got to credit Hearts for the way they came out and fought in the second half, but in the last 15 or 20 minutes we brought a bit of calmness to the game and we should have had a couple more goals. McGinn and [Peter] Pawlett had one-on-one opportunities with the keeper." Asked if his team could maintain a title challenge, McInnes said: "We just want to be a competitive team. It's very early but it's been a great start. I see the improvements. "We've got to know what we are, and what we are is a competitive team who are desperate to do well for the support. The three points were for them." Hearts head coach Robbie Neilson, whose team have followed five league wins with a trio of defeats, said he and the players would learn from the setback. He said: "We lost some silly goals. In the first half Aberdeen probably had three attempts and scored three goals. It was poor from us. "I thought we played some good football but at this level if you lose your concentration, you lose a goal and we did that today. "We had two or three minutes here and there that cost us. It's a learning curve. They need to learn you have to be focused for the whole game. If you switch off against good teams, they punish you. "Even when we got in to good areas our quality was poor. Free-kicks in good areas and corners, we should be delivering better. We were continually hitting the first man. "Win, lose or draw there is always an improvement to be made but today highlighted a lot of things that we need to be working on." Neilson believes Aberdeen are good enough to still be challenging for top spot next May and is not too despondent about Hearts' dip in results. "It's three defeats in a row but we are still sitting in a decent position," he said. "We are a team that was promoted in the summer. We are playing against a team that is three years in the making. "They are pushing now to win the league. A day like today highlights where we need to improve and how far we've got to go."